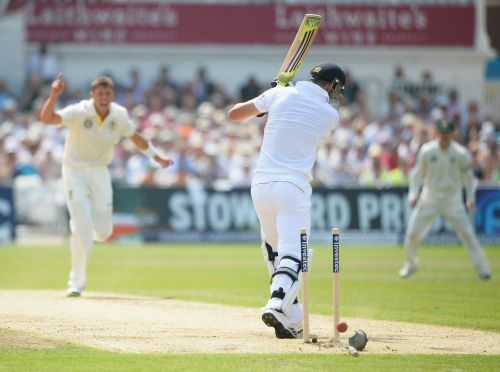 England started cautiously on Friday morning, Day III of the first Ashes Test. But the hosts were in a comfortable position at stumps. 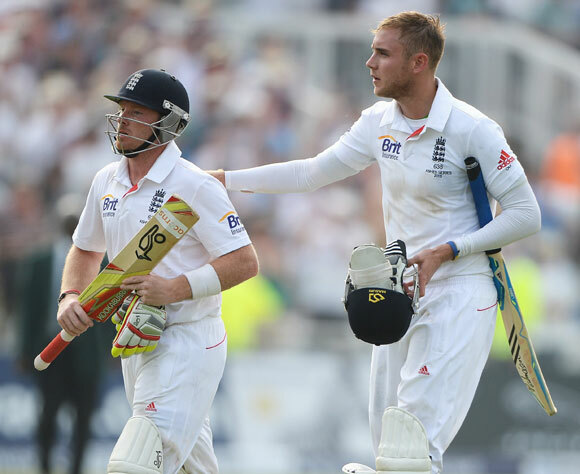 Ian Bell and Stuart Broad shared an unbroken century partnership to lift England to 326 for six, an overall a lead of 261 runs. 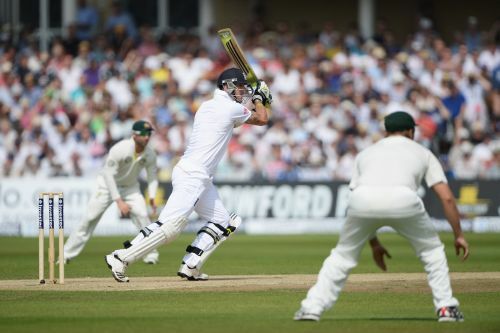 Overnight batsmen Alastair Cook and Kevin Pietersen chose to play the deliveries on merit. But soon Peietersen settled in well and stepped up the scoring. While on Thursday Pietersen was more than happy to see off the difficult period, the morning of Day 3 was all about intent. He attacked the ball more as he made his intentions pretty clear with a boundary off Peter Sidlle. He took a special liking to Mitchell Starc, as he fiercely cut and pulled the pacer for boundaries in consecutive overs from the bowler. 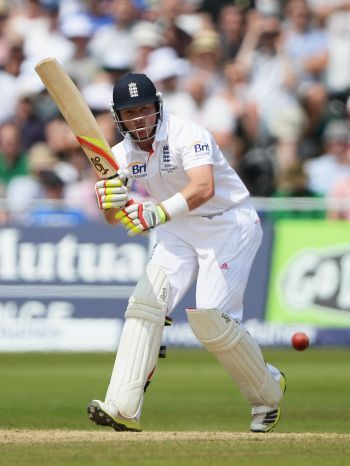 Cook gave him good company, more than happy to play second fiddle. 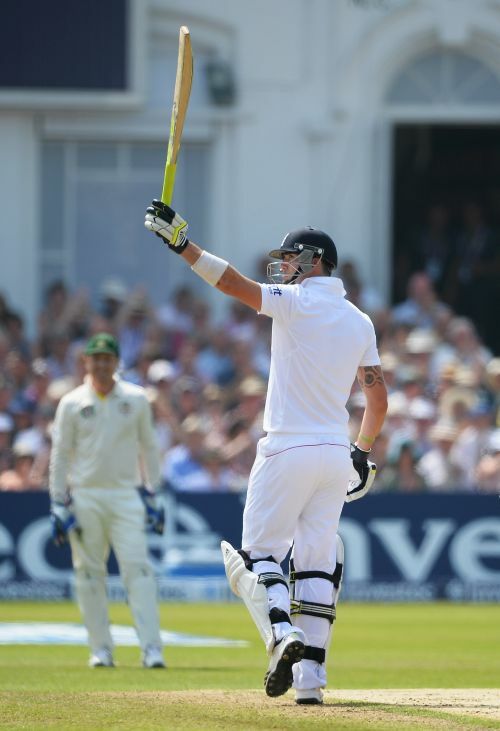 Pietersen went on to register an impressive half-century, having missed out on one in the first. After providing the early momentum, he reached the landmark with a boundary off Starc. 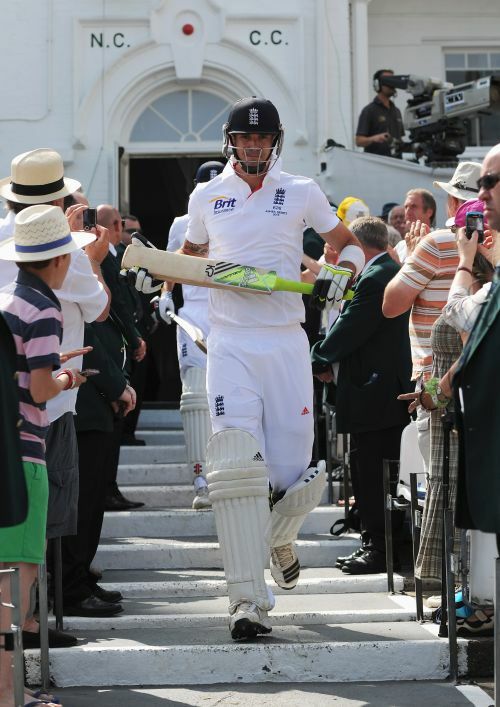 It was, however, Pietersen’s fourth slowest half-century in Test matches, as the situation demanded a patient knock. 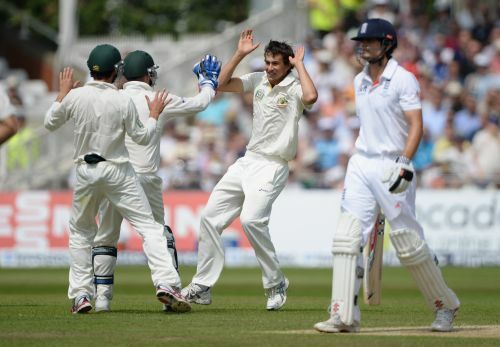 James Pattinson provided Australia the much-needed breakthrough, dismissing the dangerous-looking Pietersen for 64. The batsman let his aggression get the better of him. Chasing a wide delivery from Pattinson, he dragged the ball on to his stumps and was out after scoring 64. It was the big wicket Australia wanted desperately. Ashton Agar, who walked out to a thunderous applause in the morning, grabbed his first wicket in Test cricket, having the well-set Alastair Cook walking back to the pavilion for 50. Just before his dismissal he completed a half-century with a single off Pattinson. In the next over, looking to play one on the leg-side, he got a leading edge and was caught beautifully by Michael Clarke in the slips. 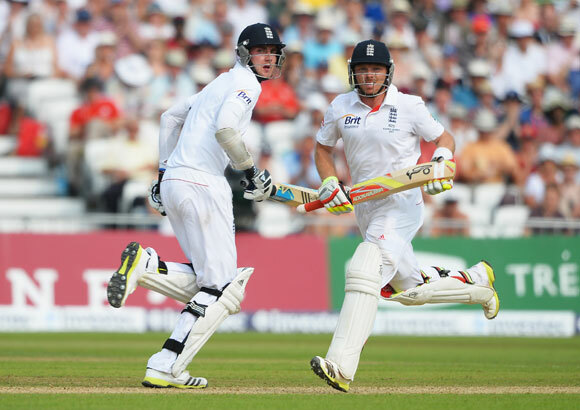 After the dismissals of Pietersen and Cook, Ian Bell and Johnny Bairstow combined well to steady England after lunch. Even though Pattinson and Mitchell Starc were able to obtain significant reverse swing, Bell looked comfortable against them. Bell, with delicate late cuts, got consecutive boundaries off Pattinson in an over. Bairstow, meanwhile, was happy dealing in singles. Debutant Agar struck another crucial blow. 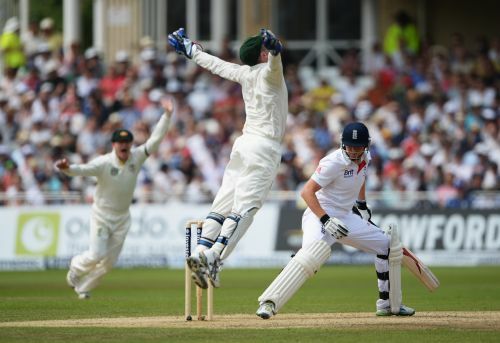 He had Johnny Bairstow walking back after having him caught behind by wicketkeeper Brad Haddin. The Bell-Bairstow partnership that was looking promising added 43 runs for the fifth wicket, before Agar extract spin from the rough to provide the breakthrough. Bell was dropped by a diving Haddin moments later and tensions spilled over on the pitch and the Australian balcony where coach Darren Lehmann was seen shaking his head and looking upset. The 31-year-old Bell was unbeaten on 95 at the close with Broad on 47 and England will now look to push their lead beyond 300 on Saturday. England eked out a lead of 261 runs in an atmosphere of great tension at Trent Bridge as controversy erupted in the final session when Broad edged young spinner Ashton Agar to Michael Clarke at first slip via the gloves of wicketkeeper Brad Haddin. Umpire Aleem Dar did not give the all-rounder out and he refused to 'walk' as he left the tourists, who had used up their two referrals, fuming. Broad rubbed salt into Australia's wounds by cutting Shane Watson for four to bring up the century partnership (108), chiselled out by the two England batsmen from 213 balls. Bell survived a huge shout for lbw off Pattinson just before the close and the right-hander will resume five runs short of his 18th Test century.